Beback is an advertising-supported program that was created for the Russian market. This adware is represented via beback.ru, and this is where you can download an extension enabling its services. 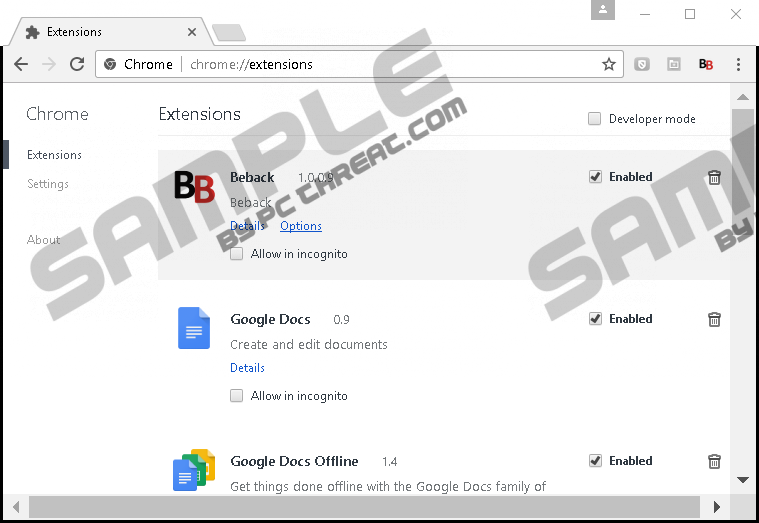 Although the extension is represented via this website, its installer is actually hosted on the Chrome web store. At the time of research, the data represented via the installer page did not show many users, and that is not surprising considering that the program is not all that useful. Although it promises to provide you with the greatest shopping deals and even offers cash back if you purchase products from supported websites, you have to look at it as just another adware that promotes third-party content. We advise removing Beback, and if you are curious about this, please keep reading. Although an official installer for Beback exists, this advertising-supported program can also be spread via third-party installers. According to our research, this extension – and it is only compatible with Google Chrome – often comes bundled with an infamous potentially unwanted program, YoutubeAdBlocker. Other suspicious programs that were found traveling along with this PUP include New Tab Minimal and Download-Loads. Needless to say, it does not have the best reputation. All in all, various unreliable programs could be packaged along with Beback, and it is your responsibility to figure that out. Since identifying malware and potentially unwanted programs can be extremely difficult, we suggest installing a trusted malware scanner without further hesitation. If serious infections exist, this scanner will inform you about them in no time. Obviously, if malware is found, you MUST delete it as soon as possible. Unsurprisingly, Beback starts showcasing coupons and advertisements soon after you install it. If you believe that the offers represented via them are very useful, you need to think again. As mentioned previously, this advertising-supported program offers better deals for those who are using the services of affiliated parties. What does that mean? That means that Beback favors the offers of affiliated parties as well, which suggests that its services are not that great. For example, if you are researching an interesting product and the adware provides you with an offer regarding that product, it does not mean that it is the best offer there is. Note that this program can record your browsing history to help associated partners to present you with personalized offers. Although that should provide you with a better service, in reality, it is done only to increase the chances of you interacting with the offers shown. What do you know about the advertisers using Beback? Unfortunately, it is unlikely that you know anything about them, and although they might be hiding behind popular and attractive offers, trusting them is exceptionally risky. As discussed already, these parties are likely to have access to your browsing history and preferences. Unfortunately, they might also use their own trackers to spy on you, and, in the worst case scenario, they could record personal information. If you wish to avoid that, you should consider deleting Beback along with all the cookies that might be associated with this service. Truly malicious cookies can be discovered by the malware scanner you use to find infections, but remember that all cookies can record certain information about you. If you want to stop this, you have to delete them. The guide below has two parts. The first one shows how to delete Beback extension, and the second one shows how to eliminate undesirable cookies. We suggest that you do both. Of course, you are not obligated to proceed manually, and, in fact, if other infections are active, we recommend using anti-malware software instead. Even if you are experienced, you simply cannot inspect your operating system and erase all threats just as quickly and efficiently as reliable anti-malware software can. Also, only this software can reliably protect your vulnerable operating system against the threats that might try to invade it in the future. Hopefully, you know what to do after reading this report, but if you have more questions for us, do not hesitate to add them to the comments section below. Tap Alt+F for the menu on the right to appear. Now, tap Ctrl+Shift+Delete keys to access the Clear browsing data menu. Select the time range, check all appropriate boxes, and choose Clear browsing data. Quick & tested solution for Beback removal.